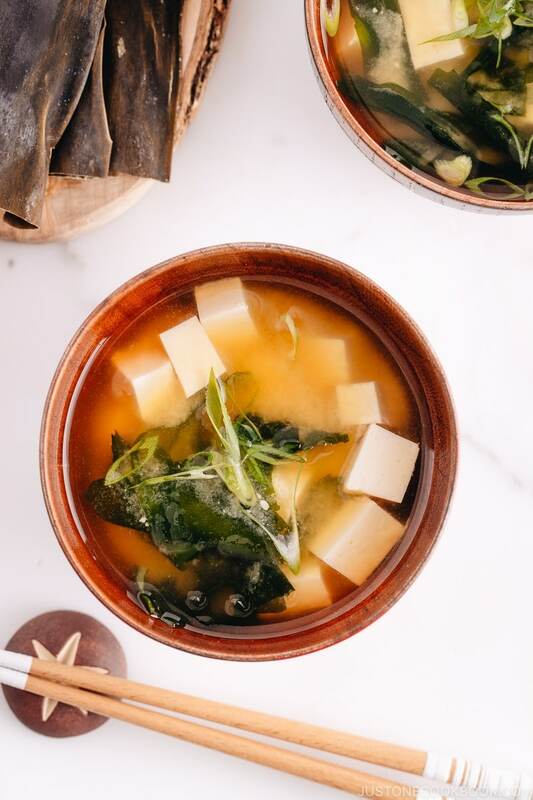 Made with kombu dashi, this authentic Japanese Vegan Miso Soup is filled with silken tofu and wakame, and packed with umami goodness! It’s hands-down the easiest soup anyone can pull off on a busy weeknight. 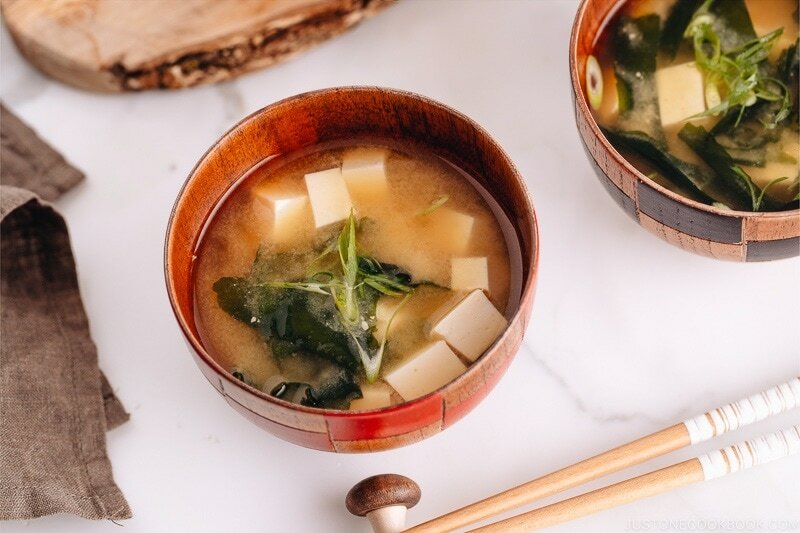 One of the common myths many people have when it comes to miso soup is that it’s not vegan or vegetarian-friendly because dashi, Japanese stock, is included in the soup. They presume that dashi is only made with fish or seafood. And now that’s NOT TRUE. Japanese stock can be made with different, and sometimes a combination of ingredients. 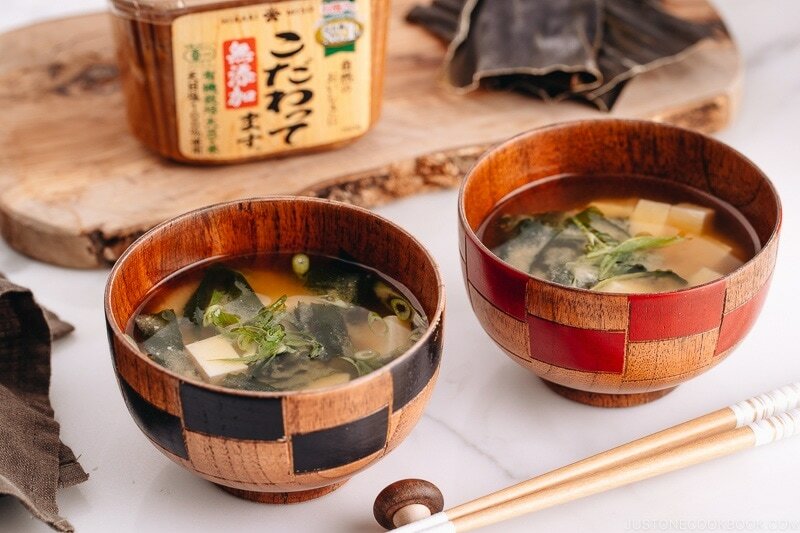 Two out of 5 types of dashi are completely vegan/vegetarian because it’s made with kombu (edible kelp) or dried shiitake mushrooms. 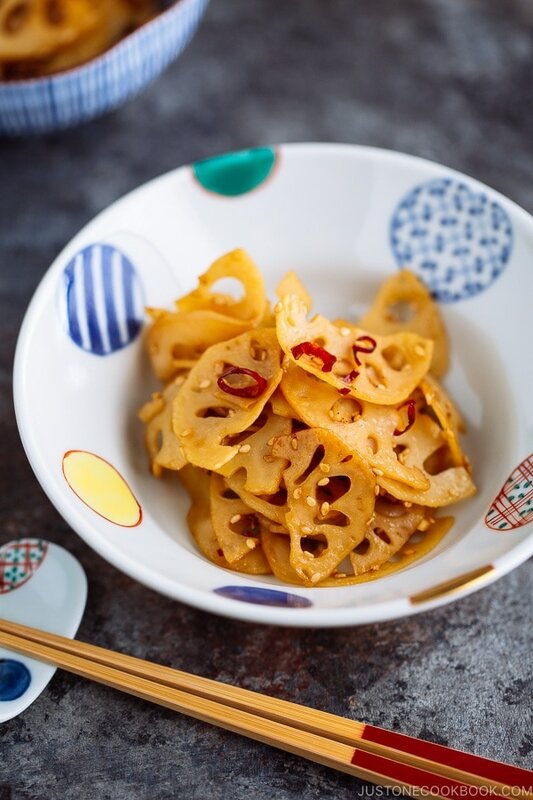 You can choose which dashi to use based your diet requirement or the dish you plan to make. Today we’ll make vegan-friendly dashi made with kombu, and then we will make miso soup with the kombu dashi. It takes less than 30 minutes to put it all together! 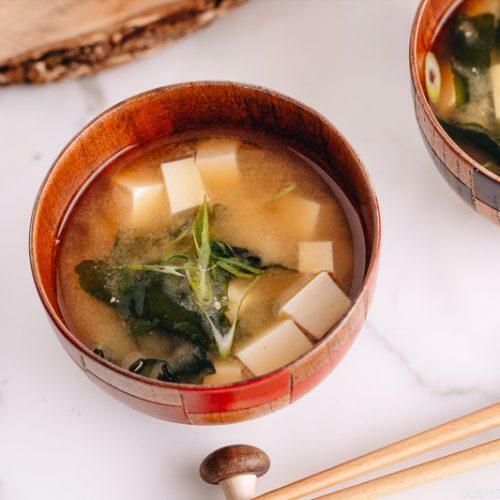 Miso soup is highly versatile and you can incorporate all sorts of vegetables/ meats/ seafood, but let’s stick to the basic, vegan-friendly ingredients today. Is any of the ingredients above unfamiliar to you? If so, you can read more about kombu, miso, tofu, and wakame on my blog. If you had never made miso soup before, you may get intimidated when you hear the word dashi. Well, don’t be! Kombu dashi is the easiest stock to make in the world. You can even extract the umami flavor by steeping the kombu in the water while you’re asleep (overnight). 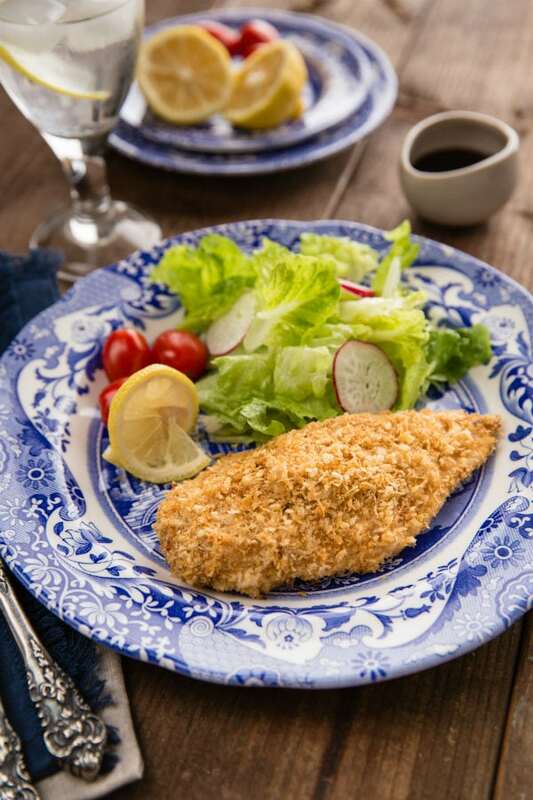 It’s perfect for busy (and lazy) home cooks like me. Today we’re speeding up the process by slowly steeping the kombu in the water on the stovetop so you don’t have to wait overnight. If you had never seen or bought kombu before, you can purchase it easily in Japanese and Korean grocery stores (or maybe general Asian grocery stores). Sometimes your local American grocery stores or co-ops may carry it too. If you have no luck, check out Amazon. You may wonder what type of miso to buy… and we’ll cover that in the next section. At this step, you’re now ready to add miso. A typical Japanese miso soup bowl holds about 200 ml of liquid. Miso varies in saltiness depends on types and brands; but as a general rule, we add 1 tablespoon (20 g) of miso per one miso soup bowl (200 ml dashi). Whenever you add tofu in the miso soup, you ALWAYS put miso first, then tofu. That way, you don’t accidentally break the fragile silken tofu when dissolving the miso paste in the soup. If you don’t add tofu at all, miso is always added at the end right before serving. How about adding other vegetables? Please hop over to Homemade Miso Soup post where I explain how you cook various ingredients for the miso soup (use kombu dashi). 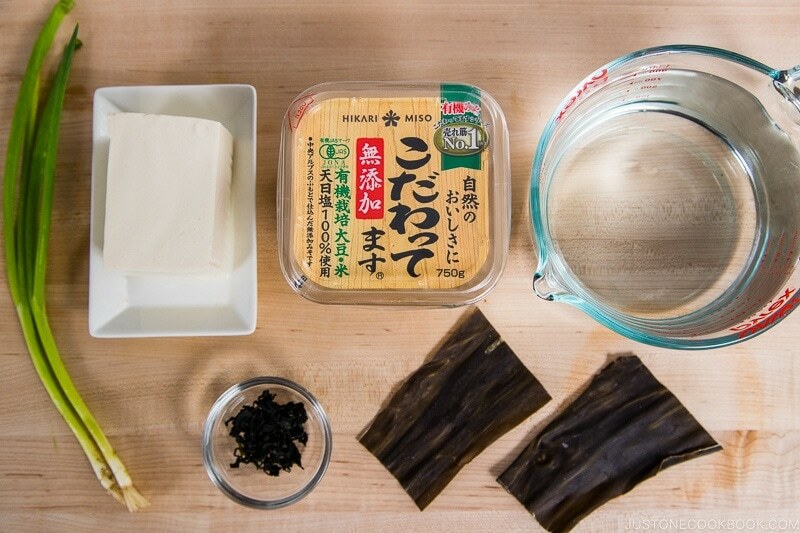 To make the basic miso soup today, we add tofu and wakame seaweed. You may see Japanese people cut the tofu on their palm (for convenience), but if you are not comfortable, just use your cutting board and carefully transfer the tofu into the soup. The proper way to rehydrate dried wakame is to soak it in water. 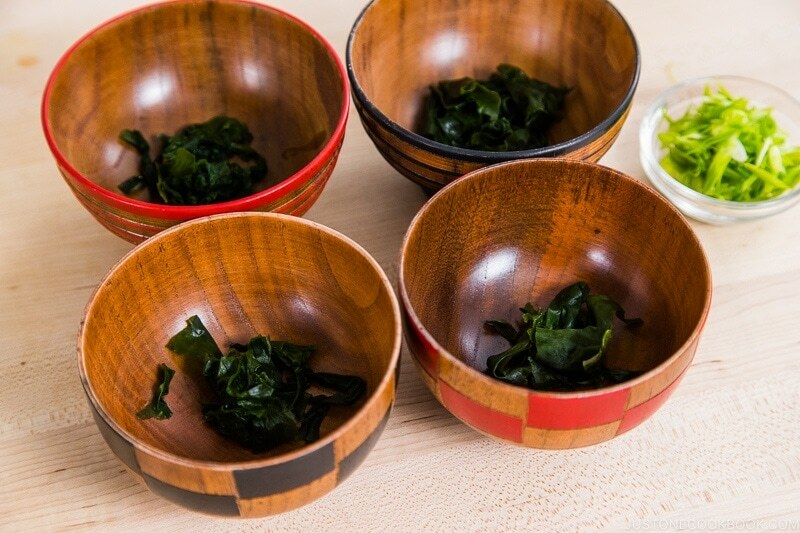 Wakame is still salty, so it’s best to rehydrate in water, squeeze the water out, and then add into your miso soup bowl. Why not directly to the miso soup in the pot? When wakame stays in the water for a long time, it loses its texture and color. No time for extra step? You can just add wakame into the miso soup (although it’s not a proper method). 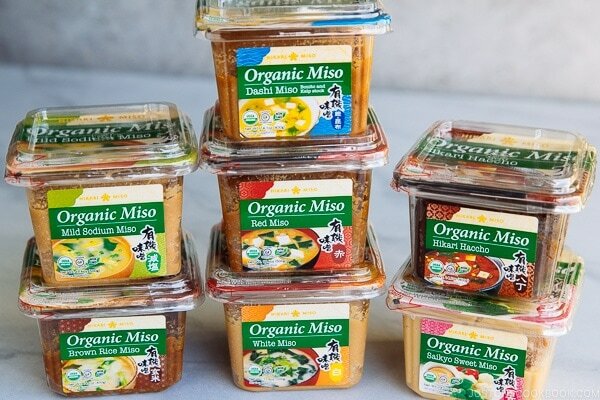 How Do You Decide on What Types of Miso Paste to Buy? That’s probably one of the most frequently asked questions I received when it comes to miso. It is similar to a question like “what type of cheese should I buy?” All different types of cheeses are still cheese, yet each one is so different from one to another. The verdict is it really comes down to one’s preference. Same thing for miso. Although you can read all about miso to be familiar with different types of miso, you may want to know one thing: WHICH miso do I like most. I got the answer for you! After trying out all different types of miso from Japanese grocery stores when I first came to the U.S., I have concluded that this Kodawattemasu by Hikari Miso® is by far my favorite! And now after over a decade of using it in my kitchen, I get to work with this company to share the miso I love (Isn’t it amazing?). 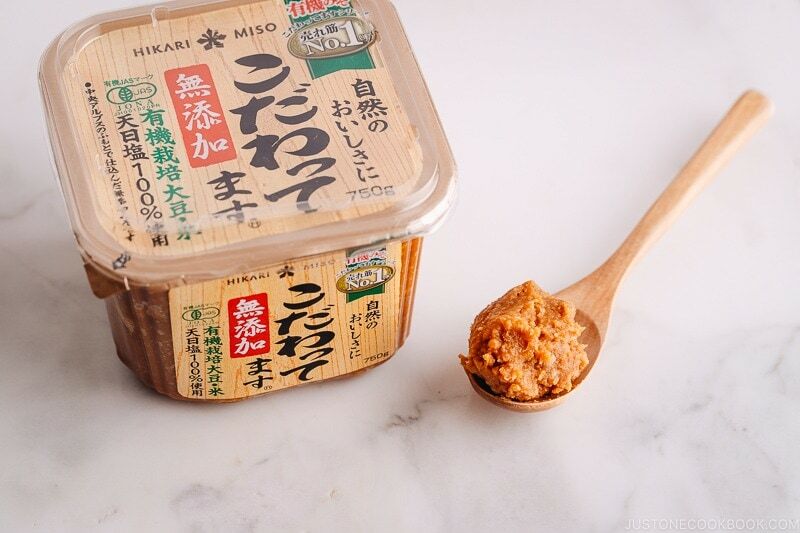 This slow-aged red koji miso is actually the #1 selling miso from Hikari Miso®. 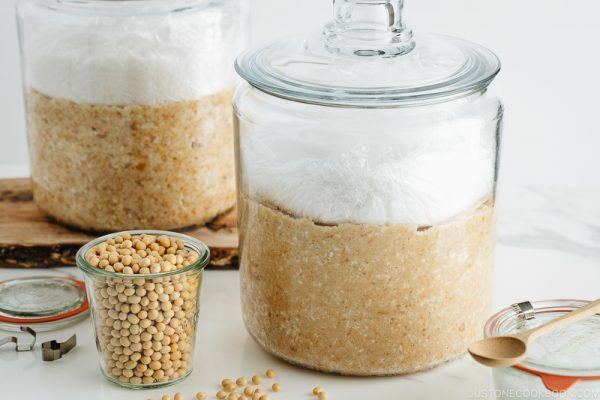 It is free of additives and preservatives, is made of organic soybeans and rice, and has a rich and mature flavor with the full-bodied umami of soybeans and the sweetness of rice. On the side note, “Kodawattemasu” (こだわってます) in Japanese means “I’m particular (about the quality of miso and the miso-making process).” It may be hard to memorize, so just remember the green label with No.1 on the package! As a staple of a Japanese meal, I have shared many versions of miso soup on Just One Cookbook. We never get bored of it because it’s easy, pack with good-for-your-gut probiotic, and the most delicious soup to incorporate seasonal ingredients. I hope you enjoy it too! 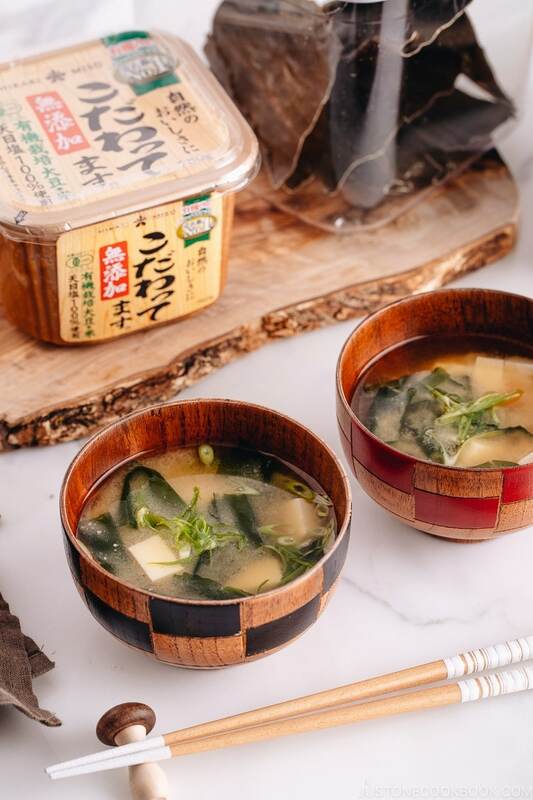 Made with kombu dashi, this authentic Japanese Vegan Miso Soup is filled with silken tofu and wakame, and packed with umami goodness! It's hands-down the easiest soup anyone can pull off on a busy weeknight. Put the kombu in 4 cups of water and let steep for 20 minutes, or as long as you can (maximum overnight). Transfer the kombu and water to a pot. Bring it to near boiling point on medium heat. If you didn’t steep for a long time at Step 1, it’s good to slowly bring the kombu water to near boiling on low heat. Once the bubbles start to appear and it looks like almost boiling, remove the kombu and turn off the heat. If you leave the kombu in water, kombu dashi can become bitter. So it’s usually recommended to take out. Now this leftover kombu can be reused to make a simmered kombu (recipe coming soon) or homemade furikake (rice seasonings). Rehydrate dried wakame seaweed in water for 5 minutes. 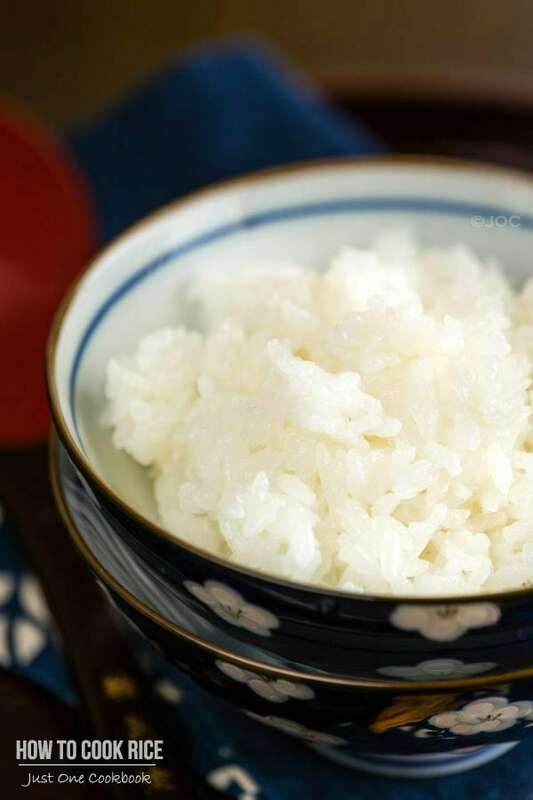 Squeeze water out and place it in miso soup bowls. 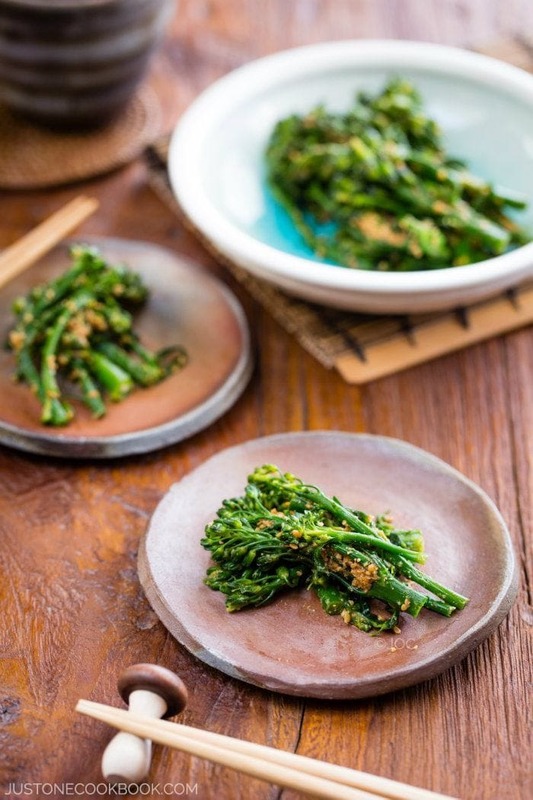 Cut the green onions into small pieces (diagonally – optional) and set aside in a small bowl. Set the miso soup bowls and green onion aside for now. Typical Japanese miso soup bowl holds about 200 ml of liquid. Miso varies in saltiness depends on types and brands; but as a general rule, we add 1 tablespoon (20 g) of miso per one miso soup bowl (200 ml dashi). 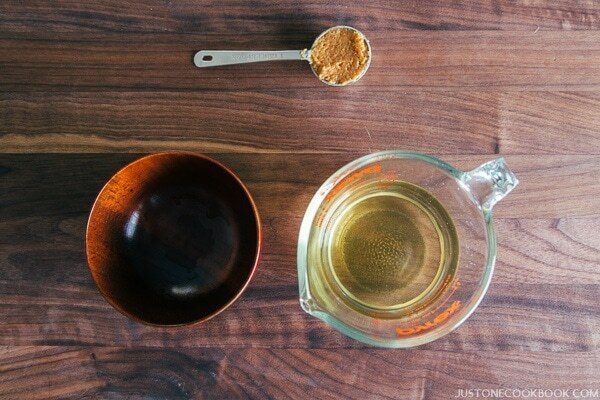 I use miso muddler (one side measures 1 Tbsp, the other side 2 Tbsp). For this recipe, I use roughly 4-5 Tbsp. Tip: When you add tofu, you may want to add an extra tablespoon (that’s why I mentioned 5 Tbsp) because tofu contains additional moisture which dilutes miso soup. Turn off the heat (when you add miso). Scoop some dashi/soup into your ladle and let the miso dissolve in the ladle first using chopsticks or a whisk before releasing to the rest of soup. It’s very important to taste. If you add tofu, the soup should taste slightly stronger than what you wish your final dish to be. Tip: Do not directly drop miso into the soup because you may end up with undissolved chunks of miso left in the soup. Cut tofu into small cubes and add to the miso soup (Please use a cutting board if you are not used to cutting it on your palm). Reheat until hot (but not boiling) and serve. Tip: After adding miso, never let miso soup boil (It will lose the aroma and flavor and also kill the probiotics in the miso. ).